Dissertatio Academica in qua Anthropomorpha, Consens. Experient. Facult. Medic. in Reg. Academ Upsallensi, Præside viro noblilissimo atque experientissimo Dn. Doct. Carolo Linnæo.... Upsala, 1760. 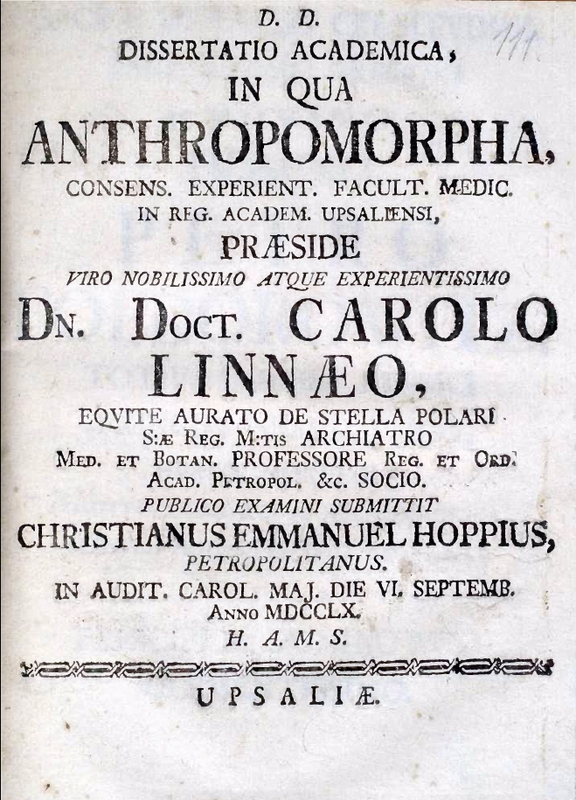 Hoppe’s dissertation was directed, as the title indicates, by Linnaeus. 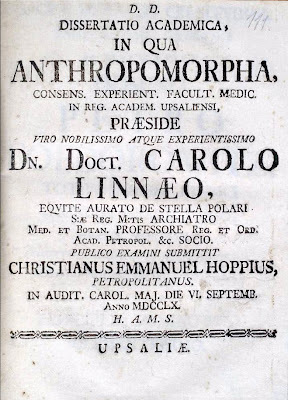 It is known that working with Linnaeus was at times a matter of the student simply taking down Linnaeus’s lecture to him. 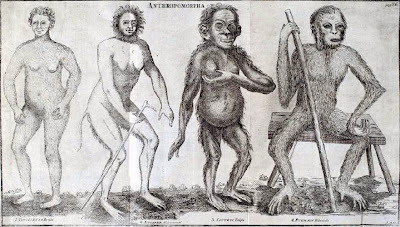 Hoppe’s dissertation goes much further into the non-human primates, especially the Apes or Anthropmorpha and suggests, based upon morphology and behavior, their close relation to humans. Note how the there is a progression in the classification. Moreover, in the illustration, the Amthropomorpha take on increasingly human features as we move from the Pygmaeus to the Troglodyta. From the text, The order is reversed in the illustration. (lit.) A Monkey with rusty hairy legs, head with hair his arms reverse. (lit.) A Man commonly called with long tail. (lit.) A Man of the night. Simia quam similis turpissima bestia nobis. Ennius. The Ape - how like us is the ugly beast. Please use Twitter for comments, questions, etc. Diversity, Culture, Theory, and Data: Science on Human Variety. --- B. Ricardo Brown and Christopher X J. Jensen --- SLAS Faculty Research Seminar. 2010 SummerClub. Powered by Blogger.